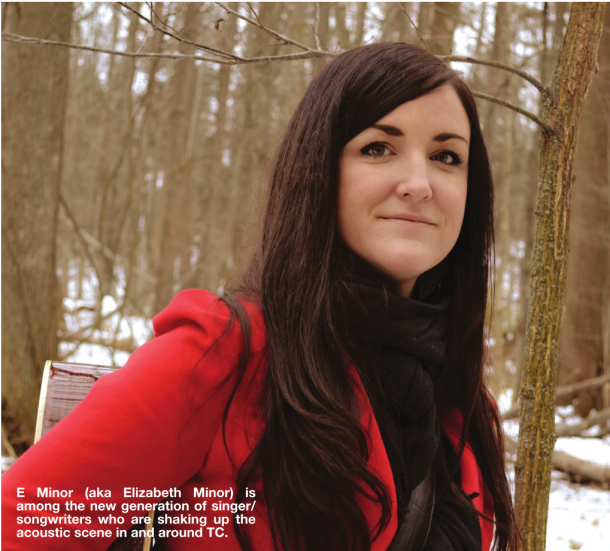 E Minor is a minor scale in music based on the note E – and it also happens to be the stage moniker of aspiring local singer/songwriter Elizabeth Minor, who’s been causing a buzz around Traverse City with her “smoky folk” melodies. Words and tunes are what Minor specializes in now, writing her own songs, which is something she started at an early age. Today, Minor’s written enough music to record a new album, which she’s funding with a successful kickstarter.com campaign. She says she was “shocked and amazed” by the whole Kickstarter experience, a crowdfunding website that allows fans of her music to financially “chip in” to a project for which they’ll receive “rewards” such as copies of her album if the funding goal is met. Minor’s been in the studio since August, and hopes to have the new album completed by spring. Her songwriting process is quite specific – she says she “almost always” starts a song with lyrics and melody, and finds one particular locale a little more inspiring than others. Guitar, she says, comes in second to her voice, and it usually takes her a long time to complete her songs, which are most often inspired by life, heartache, love, being a parent, and world issues. “I am not one of those musicians who can write non-stop,” she says. But she’s obviously got enough happening musically to fund that album and keep her fan base continually growing. E Minor will be performing at the Art Bomb at Right Brain Brewery in Traverse City on January 5. A story on the Art Bomb will run in next week’s Express.